The Department of Nuclear Medicine and PET CT is instrumental in the accurate diagnosis of many diseases and conditions. Nuclear medicine scans give physicians information about the physiology and pathophysiology of the various organ systems in the body, which is why this type of imaging is also called molecular imaging or bio-imaging. PET/CT is the work horse of modern onco imaging which can detect disease that is not identified on conventional CT scans alone. PET/CT scan consists of 2 components – the diagnostic CT (computed tomography) scan (anatomical) and the PET (positron emission tomography) scan (functional) – both in the same sitting. 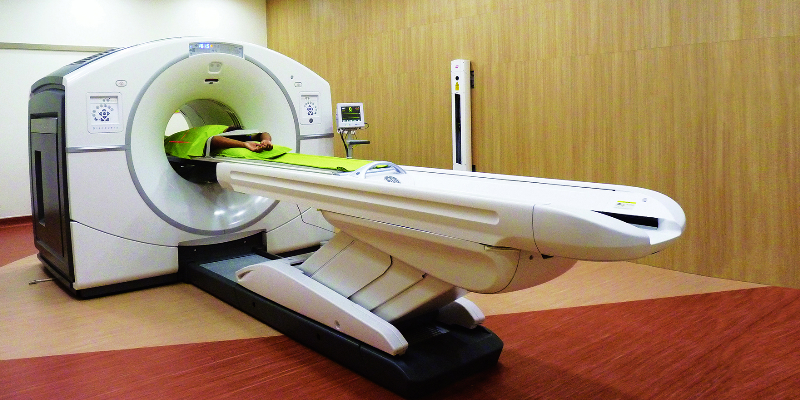 How will PET/CT scan help in a patient’s treatment? The significantly improved precision (higher imaging / diagnostic accuracy) of co-registration of anatomy and function (down to the molecular level) by the PET/CT results in improved reader (nuclear physician) confidence in earlier detection of disease precise localization and interpretation (characterization) of the hyper metabolic disease areas marked reduction in inconclusive scan findings. The PET/CT scan results not only help to have a major impact on physicians’ diagnosis of cancer but also helps the physician to predict the likely outcome of various therapeutic alternatives during primary staging / re-staging of cancer planning and individualizing treatment protocols and methods by efficiently monitoring the response of the disease to treatment. Lesser time & better patient compliance Both functional and detailed anatomical imaging done in a single setting. Avoiding un-necessary surgeries and invasive procedures. Reducing treatment related side effects. Reducing overall treatment costs. Besides revolutionizing cancer diagnosis and treatment protocols, the PET/CT is a powerful tool for diagnostic assessment of modern day diseases such as neuro degenerative disorders (alzeihmer’s, parkinsons disease etc.) and coronary artery disease. 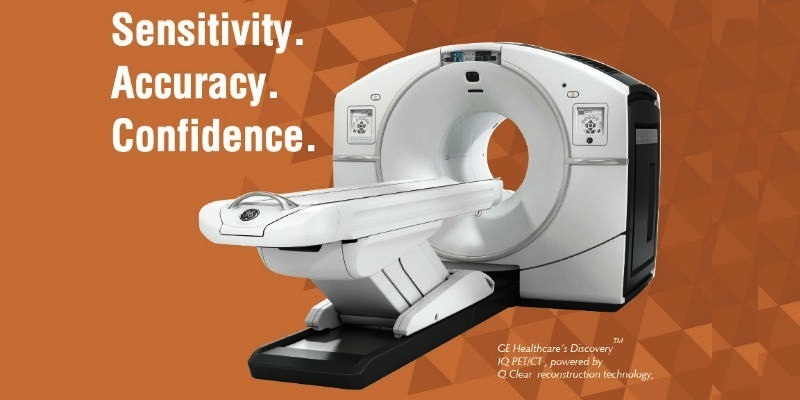 The GE IQ PET/CT at MIOT International (1st of its kind in South India) offers Superior Image Quality and Intelligent Quantitation enabling the Physician to discover and diagnose cancer confidently. Now, we can detect even minute abnormalities and offer accurate diagnoses and monitoring to our patients. Q .Clear reconstruction technology for up to 2x improvement in image quality (SNR). Q.Suite to deliver consistent SUV measurements with up to 2x improvement in quantitation accuracy (SUV mean). In MIOT International’s armoury is the latest and most advanced scanning equipment – a sophisticated Dual Head Gamma Camera with an advanced workstation and the 64 slice PET CT. The scans are simple and non-invasive, and offer clinicians detailed physiology and pathophysiology data at a molecular level across organ systems. Information and its analysis, to such an advanced degree, have put MIOT at the forefront in this speciality. The department plays an invaluable role in the diagnosis and treatment of disease in a number of specialities such as Oncology, Cardiology and Neurology. MIOT opens the door to better and safer treatment beyond imaging. 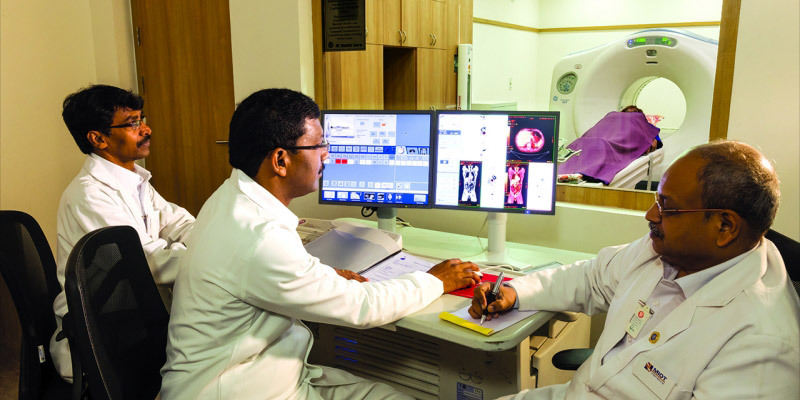 In addition to the wide range of diagnostic services (using PET/CT and SPECT) the Department of Nuclear Medicine at MIOT is equipped with the state-of-the-art radionuclide therapy ward for providing ‘Targeted Radionuclide therapy’ for certain cancers. Targeted Radionuclide Therapy is rapidly evolving into an alternative mode of treatment in oncology with better tumor targeting and lesser treatment related toxicity than conventional chemotherapy / external beam radiotherapy. Several randomized and ongoing clinical trials in cancer patients have shown its potential to improve quality of life and also increase the overall and disease specific survival. Radio-iodine therapy for localized and metastatic thyroid cancer. Radio-iodinated MIBG therapy for pheochromocytomas/paragangliomas. Peptide Receptor Radionuclide Therapy’ (PRRT) for neuroendocrine tumors. Radio-embolization therapy for primary and metastatic liver cancers. 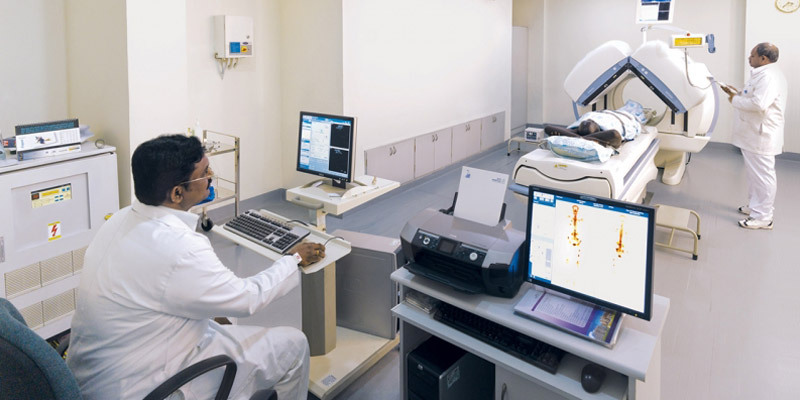 The department also administers several radionuclide therapies.All the department’s facilities and equipment have been approved by the Atomic Energy Regulatory Board of India. International protocols are followed for both diagnostic as well as therapeutic procedures.